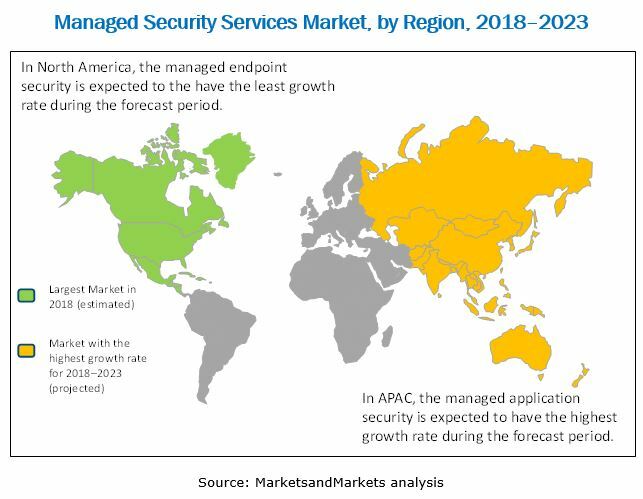 [163 Pages Report] The global Managed Security Services market size was USD 20.81 Billion in 2017 and is expected to reach USD 47.65 Billion by 2023, growing at a Compound Annual Growth Rate (CAGR) of 14.7% during the forecast period. The base year considered for this study is 2017, and the forecast period is 2018–2023. The managed security services ecosystem comprises MSSPs, such as IBM (US), SecureWorks (US), Symantec (US), Trustwave (US), Verizon(US), AT&T (US), Atos (France), BAE Systems (UK), BT (UK), CenturyLink (US), CIPHER (US), DXC (US), Fortinet (US), Fujitsu (Japan), NTT Security (Japan), and Wipro (India). The other stakeholders of the Managed Security Services market include, cybersecurity vendors, government agencies, and system integrators. Managed Security Services (MSS) are referred to as those security processes which enterprises outsource to any third-party service providers for administration, due to various reasons, such as lack of in-house experts and the need to reduce the cost of managing the services internally. MSS offers a systematic approach to manage an organization's security needs. The outsourced third-party providers who take care of these services are known as Managed Security Service Providers (MSSPs). MSSPs offer take care of everything, ranging from infrastructure establishment to security management. Various industries such as BFSI, IT & Telecom, healthcare, and energy and utilities require security services to protect their critical and confidential data and infrastructure. Although governments along with the regulatory bodies are drafting the regulations, businesses are applying their own security guidelines and techniques to protect their mission-critical data. Furthermore, the embracement of advanced technologies and extensive use of mobile devices in the working style of organizations have made organizational data more vulnerable to cyber-attacks. This is expected to have influenced enterprises to adopt MSS. MSS is gaining traction across verticals as organizations have started to realize various advantages associated with them, such as cost-effectiveness, dynamic access to data, and reduced turnaround time for business processes. Opportunities in the Managed Security Services Market include the increasing adoption of cloud services among SMEs, Threat intelligence sharing which can counter the sophisticated attacks and growing demand for the next-generation security solutions and services that is expected to boost market growth. With the adoption of cloud services, a number of SMEs, as well as large enterprises, are inclined toward having the maximum control over their data and infrastructure in the cloud globally. 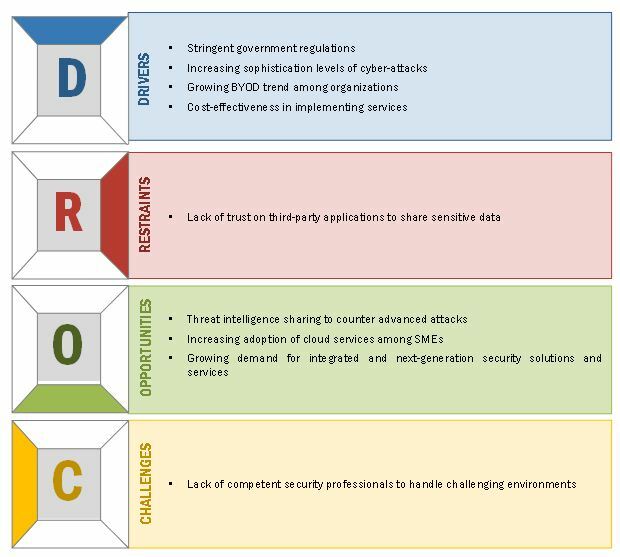 Although, Information and data security mechanisms imbibed by the organizations entails the protection of both private and public sectors from professional cybercriminals and sophisticated cyber threats, cybercriminals use advanced and sophisticated multi-layered cyber-attacks to monitor the intelligence and commercial aspects of individuals, enterprises, and even nations. Therefore, organizations are looking for integrated security solutions that enable them to both reduce the cost and improve the safety of their facilities. The global managed security services market size is expected to grow from USD 24.05 Billion in 2018 to USD 47.65 Billion by 2023, at a Compound Annual Growth Rate (CAGR) of 14.7% during the forecast period. The demand for managed security services is expected to be driven by various factors, such as the increasing instances of cyber-attacks on enterprise IT infrastructure, growing BYOD trends among organizations, and stringent regulations. 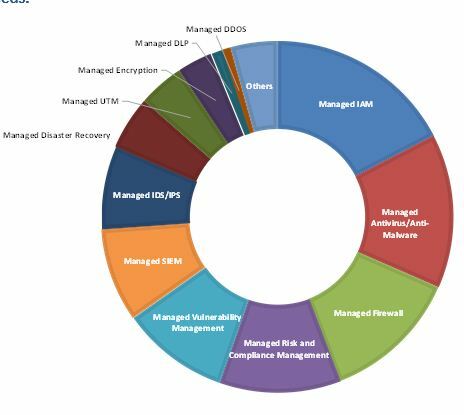 The managed security services market has been segmented on the basis of type (managed IAM, managed antivirus/anti-malware, managed firewall, managed risk and compliance management, managed vulnerability management, managed encryption, managed SIEM, managed IDS/IPS, managed disaster recovery, managed UTM, managed DDOS, managed DLP, and others), security type, organization size, deployment type, vertical, and region. The managed encryption services segment is expected to grow at the highest CAGR during the forecast period due to the wide adoption of encryption solutions and services by organizations. The increased adoption and growth of email platforms and the rising cyber threats which threaten the integrity and confidentiality of these platforms are expected to drive the growth of the segment. However, the managed IAM segment is estimated to hold the largest market size in 2018 in the market as there is a greater demand for BYOD security solutions in the enterprise segment. The global Managed Security Services market has been segmented on the basis of 5 major regions, namely, North America, Europe, Asia Pacific (APAC), Middle East and Africa (MEA), and Latin America, to provide a region-specific analysis in the report. North America, followed by Europe, is estimated to be the largest revenue-generating region for managed security service vendors in 2018. This can be attributed to the developed economies, the US and Canada, as there is a high focus on R&D of security technologies and solutions. APAC is expected to be the fastest-growing region in the market, due to the increasing adoption of advanced technologies that are leading to increasing instances of cyber-attacks on enterprises. Major vendors in Managed Security Services Market include IBM (US), SecureWorks (US), Symantec (US), Trustwave (US), Verizon(US), AT&T (US), Atos (France), BAE Systems (UK), BT (UK), CenturyLink (US), CIPHER (US), DXC (US), Fortinet (US), Fujitsu (Japan), NTT Security (Japan), and Wipro (India). These players have adopted various strategies, such as new product developments, collaborations, partnerships, and acquisitions, to expand their presence in the global Managed Security Services market. 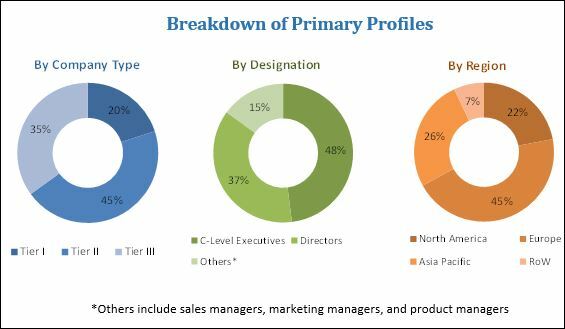 The growth of MSS market is depending on the factors, such as stringent government regulations, increasing sophistication level of cyber-attacks, growing BYOD trend among the organizations, and cost-effectiveness in implementation of services are expected to drive the market growth. Various established players and new entrants in the industry are offering the different types of managed security services for the enterprises to serve their varying security needs. Identity management is the process of managing or authorizing attributes, such as phone numbers, email addresses, or a social security numbers. Whereas, access management is the process of authenticating identities. It allows the right individuals to access the right resources, at the right time, and for the right purpose. In addition, it includes user management and central user repository techniques. Managed IAM provides a business security process framework, enabling initiation and management of user identity and related access permissions in an automated fashion. Managed IAM offers provisioning, advanced authentication, directory technologies, password management, audit, and Single Sign-On (SSO) features. Identity-as-a-Service (IaaS) is also gaining traction, due to its centralized nature and cost-effectiveness. With the rapid increase in the trends of connected devices, IoT, and mobile devices, the trend of having universal authentication is also expected to prevail for flexible, simpler, and streamlined authentication. Antivirus software is a set of programs that detects, prevents, and mitigates cyber threats caused due to viruses. Antivirus software is used to prevent, detect, and remove malicious activities, such as computer viruses, rootkits, adware, spyware, malware, Trojans, and worms. On the other hand, an anti-malware is a software program that detects, prevents, and remediates malicious codes from being executed in a system. Malware is a broader term that encompasses virus and spyware, and creates threats against intellectual, personal, and financial information. Cyber risk refers to the financial loss or damage to the reputation of a company caused due to the failure of the IT system. Compliance is a set of established guidelines or processes. Risk and compliance management is an amalgamation of 2 separate terms, risk and compliance. The risk management approach mitigates the impact of risk on business processes and employs detection, mitigation, transfer, and control of critical events for business. Hence, the solution helps an organization in combating a wide range of risks related to technology, commerce, information security, and operation. Supply chain is a complete arrangement of organizations, individuals, resources, information, data, and assets necessary for moving products and services from providers to the end users. Activities in the supply chain transform raw materials into finished products and finally deliver these to customers. Traditional supply chain includes elements such as suppliers, manufacturers, wholesalers, retailers, and finally, customers. The analytics application for supply chain planning and optimization offers data administration and visualization capacities for the supply chain industry. The implementation of analytics in the supply chain is gaining traction because it holds huge potential for innovations and provides a competitive advantage. However, compliance depicts adherence to policies, procedures, and guidelines for regulatory and operational standards. The need of the hour is to maintain strict levels of compliance and security, which is a complicated and time-consuming task. Vulnerability management is a proactive approach to secure sensitive data by eliminating the weakness in the network security, which includes contingent cyber threats, such as dormant malware attack and other advanced invasion techniques. The process includes the checking and identification of risks, along with mitigation and patching of the unwanted software program. Businesses rely on this solution to quickly assess and prioritize vulnerabilities, and scan the network asset information, security configuration, and threat intelligence. This segment covers products that scan devices. The products include servers and workstations or applications/software that uncover known as well as unknown vulnerabilities. Factors such as the increasing use of diverse operating systems, increasing volume of data, rapid adoption of the BYOD trend, growing number of mobile devices at the workplace, and cloud computing are expected to contribute to the market growth of the managed vulnerability management segment. The expanding security threats are prompting businesses to adopt frequent assessment and monitoring techniques to identify vulnerabilities in their systems. SIEM is a combination of the functions of Security Information Management (SIM) and Security Event Management (SEM) in a single security management system. SIEM, for analysis purpose, collects logs and other security-related documentation. It is quite expensive to deploy, and complex to operate and manage. PCI DSS compliance is expected to be one of the drivers for the adoption of SIEM in many transaction-based verticals. The process of detecting and preventing events that are trying to violate the confidentiality, integrity, or availability of data is referred to as IDS/IPS. IDS/IPS is a network security solution that monitors networks and systems to identify malicious activities. It also detects information about the activities, attempts to prevent them, and finally reports about the activities. The segment is inclusive of Network-Based IPS (NIPS), which monitors the entire network for suspicious traffic using protocol activity; Wireless IPS (WIPS), which controls a wireless network from malicious traffic by analyzing the wireless networking protocols; and Host-Based IPS (HIPS), which monitors a single host for suspicious activities by pretending to be an installed software package. Disaster recovery is a policy and procedure-driven planned solution that helps organizations protect themselves from cyber disasters. It eventually focuses on IT or technology systems that support business functions for business continuity. The effective implementation of backup and data recovery strategy leads to successful recuperation from disasters. Data recovery solutions help in retrieving the data from damaged, failed, corrupted, or inaccessible files. There is frequent loss of data from storage media, such as hard disk drives, solid-state drives, USB flash drives, storage tapes, CDs, DVDs, and other internal or external sources. The data crash problem can be due to operating system failure, disk-level failure, deletion of files from storage mediums, corruption of file systems, or overwritten data. Therefore, Disaster Recovery as a Service (DRaaS) is gaining popularity, as it offers a holistic approach for business resiliency. Due to this, every organization has started investing either in private cloud data recovery solution or both private cloud and DRaaS. UTM is a holistic security management approach that enables a security administrator to supervise and manage various cybersecurity components. It is an integrated security solution that comprises features, such as network firewall, antivirus, anti-malware, IDS/IPS, Virtual Private Network (VPN), load balancing, data leak prevention, SSH, identity-based access control, SSL, content filtering, and on-appliance reporting, to offer tremendous value to organizations. Encryption is the method of converting electronic data into ciphertext; a format that cannot be easily understood by the unauthorized person. The major objective of encryption is to prevent confidentiality and integrity of the digital data stored in a computer or transit. It protects digital information from unauthorized access by making the information unreadable. Any mobile device that can store data is a potential weak point. It is not possible to control who has possession of or transfers confidential files onto mobile devices. However, the access to that data can always be controlled with the managed encryption service. Advanced managed encryption services are integrated with other MSS to provide enhanced data protection at a lower cost. These services protect user’s data both in the cloud environment and on-premises. DLP is a security approach that prevents sensitive data from being transmitting outside of an organization. It is a comprehensive data security solution that ensures information loss prevention while the data is in endpoint actions, network traffic, or storage. It also addresses data security needs when the data is at rest (providing perimeter security, network monitoring, internet access control, and messaging control), in use (SIEM, user monitoring, usage monitoring, application control, and IAM), and in motion (endpoint security, mobile device protection, encryption, firewall, and physical media control). The DLP technology uses business rules or policies or procedures for effectively performing its operations. Sensitive data such as secret company information, Intellectual Property (IP), and financial information are protected from unauthorized disclosure by deploying risk assessment measures, strict governance, and privacy compliances. Managed DDoS mitigation is a technique to overcome DDoS attacks on systems attached to the internet. This attack is highly severe and demands high security. DDoS attacks come with a high magnitude of network traffics from customized software and eventually, this false traffic delays authorized web traffic, which leads to the depletion of network bandwidth, computing power, and operating system data structure resources and inundation of network infrastructure. The denial of service is a well-framed activity executed from the attack master system to a network of computers. The sophistication of DDoS attacks is increasing; for instance, in April 2015, TMT (Thirty Meter Telescope), the most advanced optical telescope became the target of an unscrupulous DDoS attack. More than 70% banks across the world, including HDFC, U.S. Bancorp, JPMorgan Chase, Bank of America, SunTrust, HSBC, Ally Bank, BB&T, and Capital One faced single and multiple DDoS attacks. The other MSS segments include managed web filtering, managed application whitelisting, and managed patch management. Managed web filtering is a set of codes that filters incoming web pages and decides whether it should be displayed to the user or not. Web pages such as pornographic content, adult/mature content, personal interests, spyware, viruses, and offensive advertisement are restricted with the help of managed web filtering. It restricts internet surfing among employees and secures networks from cyber adversaries and reports about the kind of traffic being filtered by the users. The program shows pop-up messages or pages for soft blocking users from vulnerable sites. These MSS are available for physical appliance, virtual appliance, or a combination of both. Managed application whitelisting is a practice that restricts unauthorized programs from running. The managed application whitelisting solutions help in securing devices and networks from harmful applications. The whitelist is a list of applications that are allowed to run in an infrastructure. These solutions then monitor, check the running applications, and compare them with the whitelist. Only if the running application matches the whitelist, they are allowed to run, or else, these solutions block the applications. Managed patch management is a system management process that includes collecting, testing, and installing multiple patches. These solutions help protect systems from vulnerabilities and maintain security and system availability. Which are the substitute service types and how big is the market landscape for them? Which are the top use cases where MSS can be implemented for revenue generation through new advancements such as BYOD and Cloud services? What are the potential opportunities in the adjacent markets, such as Managed Services and Cyber Security Services?